Though German cities grab most visitor's attention, the country's natural attractions can be equally showstopping. In Frühling (spring), avenues of Japanese kirschbäume (cherry trees) burst into pink blossoms to welcome the country back from the dull greys of winter. An embodiment of spring, the delicate blossoms are eagerly anticipated and as soon as they appear people are quick to fawn over them. For 10 days to three weeks sometime in April to May (depending on the weather), rows of glorious cherry blossoms become an attraction for walkers, photographers, and picnic-ers. An accurate prediction of exactly when the blooms will hit their zenith is impossible, but the bluetenbarometer can help you guesstimate. An exported Japanese tradition, the Sakura Campaign brought the blossoming trees to Germany after reunification. Japanese channel TV Asahi collected over 140 million yen (around 1 million euro) to gift the trees to Germany as well as locations from Washington D.C. to Macon, Georgia. Here are the best places to enjoy the phenomenon of cherry blossoms in Germany. Not known for the most beautiful anything, photographers put Bonn and its dreamy pink blossoms on the map. 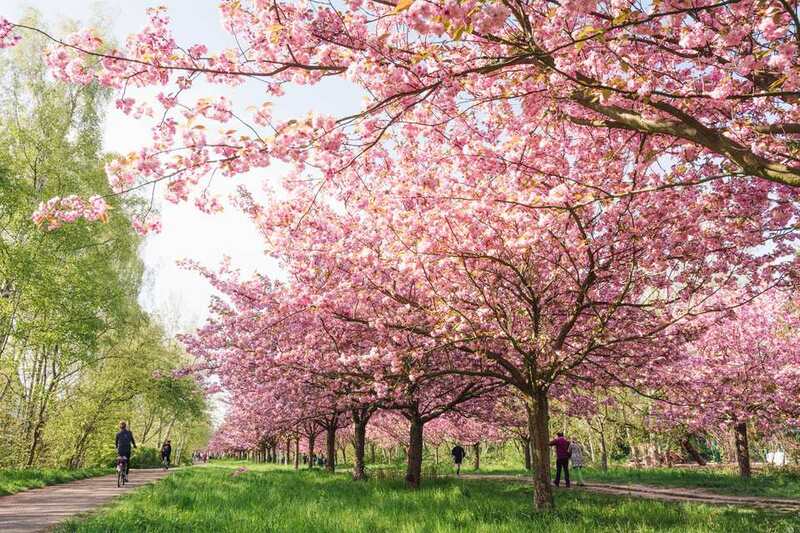 Earning a place on "Top 10 Most Beautiful Tree Tunnels In The World", Bonn's Heerstrasse in the Nordstadt neighborhood is known as "Cherry Blossom Avenue". The long limbs of the trees are weighed down with blooms, creating a tunnel-like canopy. The street's popularity can make it quite crowded with more people than flowers. Try visiting in the early evening to avoid the crowds and enjoy the pink shaded lamplight. Bonn's Kirschblütenfest takes place in the altstadt (old town) at the height of the blooms. Like so many things in Berlin, the blossoms are not only beautiful but have a story to tell. Part of the Sakura Campaign, 9,000 trees were planted around Berlin and Brandenburg starting in November 1990 - shortly after reunification and the fall of the Berlin Wall. There are over 50 locations to enjoy Berlin's cherry blossoms from parks to graveyards. Many replaced the desolate stretches that used to line the Berlin Wall. Where the totestreifen (death strip) once stood, pink blossoms now flourish. These extend throughout Brandenburg along the innerdeutsche Grenze (inner German border). Bornholmer Straße is located in the north of the city beneath the bridge of the same name. Along with 215 Japanese Cherry trees, there is a memorial to the Sakura campaign. Before admiring the trees along the Mauerweg (Wall Way), check out the Fall of the Wall memorial at the top of the bridge. Around Glienicker Brücke (Glienicke Bridge), better known as the Bridge of Spies. Lichterfelde Süd station's trees can be found by walking down Holtheimer Weg. Lohmühlenbrücke at the border of Alt-Treptow and Neukölln has 45 cherry blossom trees and another memorial to the Sakura-campaign. Gärten der Welt's (Gardens of the World) beautifully landscaped lawns are adorned with eighty trees. Note this park charges admission and there is an annual Kirschblütenfest (more info below). Just northeast of Wollankstraße S-Bahn, trees border the track on a former death strip. Frankfurt (Oder)/Słubice is on the Eastern border with Poland and sports 750 cherry trees planted in 2003 for the city´s 750th-anniversary. There are two Kirschblütenfest (cherry blossom festival) in Berlin. Japanisches Kirschblütenfest Hanami: The blossoms are joined by market stalls of food, crafts, and fruit wine. In addition to the usual festival findings there will be Japanese products and food. Kirschblütenfest at Gärten der Welt: This festival also celebrates the blossoms and Japanese culture. There are cos-players, dancing, and performances take place on stage. In addition, there is Baumbluetenfest in Werder just outside of the city in early May. Hamburg's trees also turn pink for spring. The Sakura were offered as a gift from the emerging Japanese community and the yearly cherry blossom celebration honors the special relationship between the two communities. Alsterpark is the best place to find long lines of blossoming trees. Look for the flowers at Alsterkrugchaussee, Kennedy Bridge and at the Altonaer Balkon. This spring festival has been taking place since 1968 and honors the Japanese community as well as the blossoms. Sister city with Osaka, there are Japanese performances, a cherry queen and a spectacular fireworks display over the Alster around 22:30. Stray trees can be spotted throughout Munich and even in apartment Hofs (courtyards). The best place is in Munich's premier park, the English Garden. Or try the hill in Olympiapark, home of the 1972 Olympics. Dortmund just started celebrating Kirschblütenfest, but its many cheery trees across Botanical Garden Rombergpark provide the perfect backdrop for a festival. The garden once held many of these blossoming trees and is reinvesting in new stock to keep the spirit of the cherry blossom alive. The annual festival includes Japanese performers and is held at Romberg Park.